Raef "Hollywood" Granger is in the third chair as we make our predictions for 2019. Do you agree? How far out on a limb will we go for a few points? Join Craig, Russ, & Paul Shoemaker of Captain Con as we discuss what we've geekiness we've been up to in November 2018. Craig, Russ, & Romeo from Battlefoam talk about the new ork hotness from Games Workshop: Speedfreaks. This time we focus on rules. While Craig is distracted Russ tries a whole new concept: An audio Unboxing. Listen to Russ's real time reaction as he opens and goes through the new Games Workshop game: Speedfreaks. Will he fanboi out as he looks through sprues of orky goodness? Craig and Russ engage in battle in Warhammer Underworlds Shadespire/Nightvault game play. They share their thoughts each turn in this new Pip experiment! Craig and Russ discuss the geeky goodness they've been enjoying in Sept 2018. Craig & Russ have jumped into Dropfleet Commander and appear to be hooked. What is appealing to them after their first few games? Adam and Brady Sadler, game designers of no small water, are in the 3rd chair! Up first, the Sadlers are big video game fans so we catch up on the vid games that everyone has been enjoying lately and why we're playing htem. Later we dive into the many game projects that have involved the Sadlers including some of the latest hotness such as Brook City from Blacklist Games. The Stagliano brothers are in the 3rd chair! Up first, we hear from Michael on how he got into screen writing and how his love for fantasy & gaming influenced him and his opportunities. Later we dive in with Steve and learn about their new gamecast... "Tavern of Heroes"
The Adepticon 2018 mob is in the 3rd chair!! We try a new format to get thoughts on a game while we play them! Up first: Firefly Adventures by Galeforce Nine. And later GKR: Heavy Hitters by WETA Workshop and Cryptozoic. Ambie Valdes, of the Boardgame Blitz podcast, joins us in the 3rd chair. Up first we all discuss the appeal of long form games and Ambie fills us in on the world of 18XX gaming. Later Ambie, Craig and Russ discuss Escape rooms and why they particularly appeal to gamers. Curt Covert, of Smirk & Dagger and Smirk & Laughter Games, is back in the 3rd chair!! Up first we talk to Curt about what he's been up to and why two companies? Later, Raef "Hollywood" Granger joins Russ in "Tech Talk"
Raef "Hollywood" Granger is back in the 3rd chair. And just in time to as we do our annual predictions episode. We review what we predicted last year and make predictions in the gaming and geek world for 2018. Seppy Yoon, of Fight in a Box, joins us in the 3rd chair! Up first we get an update on all Fight in a Box has been up to recently. Later, both Seppy and Russ attended the very first PAX Unplugged. What did they think and what made it unique? Andrew 'Hacksaw' Hartland is back in the 3rd chair. Andrew brings us up to speed on what's new at Captain Con this year and then we dive into some family game reviews including Santorini and Bunny Kingdoms. D6G Ep 222: Stronghold Games Update & Who's Character is it Anyway? Stephen Buonocore, of Stronghold Games, joins us in the third chair! Up first, Stephen gives us the update on Stronghold Games along with their new hotness coming this fall, like Space Freaks. And later..."Who's Character Is it Anyway?" in which we try our hand at RPG improve? Doug Johnson of Tablewar is in the 3rd Chair!! We catch up with Doug on all the hotness from Tablewar including the new GEO mat. Later Craig and Russ dive into Catalyst Game Labs' brand new game: Dragonfire. Does this deck builder set in the Dungeons and Dragons universe catch Craig's fancy. The Gen Con 50 mob is in the 3rd Chair!! We chat with them and Total Fan Girl about what hotness was spotted at Gen Con 50. Later we interview Will Schoonover from Privateer Press about the upcoming new skirmish game: Company of Iron. And finally, it's time for another Play By Mob. Lindsey Rode, of Dog Might Games, joins us in the third chair! Up first we learn about Lindsey's origin story: How did she get into the industry and eventually land the sweet Valkyrie gig at Dog Might. Then later the three of us examine how and why gamers like to bling out their games. Ray Greenley, voice over guy and passonate gamer, joins us in the 3rd chair! Up first Ray gives us insight into how he got into voice over and narrating audio books! Later we take a good look at the game Clank! Can this deck building card game appeal to someone like Craig? Mack Martin, games designer & passionate miniature gamer, joins us in the 3rd chair! Up first we learn about the Conan: Rise of Monsters game. What was the games goal and what was unique about the rules and design? Later Mack, Craig, & Russ discuss recent trends in miniature gaming. How do things look in 2017? Dean Gilbert, Mr. TORG himself, joins us in the 3rd chair! Up first, Dean brings us up to date with all things Torg, including the new hotness launching this summer: Torg Eternity. Does the new version pack in all the nostalgia while bringing new hotness. And if you don't know what Torg is...no worries, Dean will fill you in. Later, Craig & Russ walk Dean through the new 8th edition of Warhammer 40,000. We've got the box...played it, and we have thoughts! Will it bring about a new 40k revival? Andrzej Probulski, the man behind the amazing terrain at Multiverse Gaming, is in the 3rd chair!! How did he, and Multiverse, get started? And later...The Walking Dead Miniature Game! Ronnie Renton, the man behind Mantic Games, is in the third chair! We chat with Ronnie about he got his start in the industry and what lead to Mantic Games. Later we take a stroll down memory lane with Ronnie and discuss the history of terrain in miniature war gaming. Geoff Engelstein is back in the third chair! Geoff takes a break from instructing the next generation of game designers to let us know what he's been up to including a preview of his latest game, "The Expanse Board Game" based on the SyFy series. Later we review Assault of the Giants, a board game set in the Sword Coast of Dungeons and Dragons. App of the Ep: 53 min - C.A.T.S. Ash Barker, of the Guerrilla Miniature Games YouTube Channel, joins us in the third chair! Up first, we get to know Ash. How did he get into gaming and what was it like starting up and building a YouTube channel dedicated to streaming a wide variety of miniature game battle reports. Later, Craig, Ash and Russ discuss "Miniature Agnostic Games." What is their appeal and why are they so under rated? Crstal Pisano, of the Boardgame Bliz Podcast, joins us in the third chair! Up first, What is the origin story of the Boardgame Bliz podcast and what are some of the challenges of starting a podcast in a time when there are so many choices? Later, Craig and Russ got early copies of Fantasy Flight Games new miniature game: Runewars! We preview it and share thoughts with Crystal to see if it can appeal to a board gamer who has never sampled miniature gaming before. Raef "Hollywood" Granger is back in the third chair. Since it's been a while, Raef and Russ dive into some tech talk: video games, internet connectivity and more. It's all in there. Later Craig and Russ chat about Captain Con 2017. How was the con and specifically how did our Konflict 47 event go? Eric Teo, digital game developer and host of the "Push Your Luck!" podcast, joins us in the third chair. Up first Eric shares his discoveries of the complexity of mobile app design. What did he learn developing his and what challenges have others run into trying to adapt board games to mobile apps? Later we dive into Seafall by Plaid Hat games. It has been receiving mixed reviews since it's launch. How does it compare to other legacy games, and is it fun? JJ Layfield, former host of 'World's End Radio' and avid miniature gamer, joins us in the third chair. Up first we take a look at how changing technology has impacted how games, specifically miniature games, have been delivered over the years. Later we get into the details of Guild Ball Season 3. How has the game changed and what do we think about the changes? Raef "Hollywood" Granger is back in the third chair for our annual predictions episode. Up first we go through our predictions for 2016...how did we do? Who was the most accurate this year? Later we look forward into the mists of time and try to foresee what geek related events will occur in 2017. Paul Shoemaker of the NE Privateeers & Captain Con is back in the third chair. Paul brings us up to date on what's been happening with Captain Con and what to expect at Captain Con 2017, just a little over a month away. Later we dive into the new game from Gale Force 9: Star Trek Ascendancy. How does this 4x space exploration game with Klingons, Romulans, and the Federation play? Rich & Mat, the men behind Steamforged Games, are back in the third chair as we record live from SteamCon 2016!! We get to sit down and play one of the first near-production copies of the new "Dark Souls" board game coming next year, and we get to chat with the designers. How are they going to deliver on this epic kickstarter? You be the judge as you hear many of the design decisions and mechanics. Up first, Mat and Rich bring us up-to-date on all the happenings at Steamforged Games...not to mention how SteamCon 2016 went! D6G Ep 201: Essen 2016 & What makes a game attractive? Stephen Buonocore of Stronghold Games returns to the third chair! Up first Stephen fills us in on Essen 2016. How does the largest gaming event in Europe continue to evolve? What was the hotness this year? And speaking of hotness, later we ask ourselves the question: Since we are so spoiled for choice, what attracts us to new games? Raef 'Hollywood' Granger returns to the third chair to help us celebrate our 200th episode! We couldn't let our 200th episode pass us by without at least a look back at what got us here. Raef, Craig, & Russ, with the help of submissions from our listeners, remember favorite moments from the first 199 episodes. But first we here from a host of third chairs (see what we did there) as they share what they enjoyed about being a part of the show. A big thank you to all of them, and all of you!! Luke Retallack, of World's End Radio & Channel Endgame, returns to the third chair! Since Luke has a new channel called "EndGame" we thought it would be fun to do a mulling mechanics on 'end game mechanics'. What do different games do to drive to conclusion and which do we like best? Later we cover a topic that Russ loves to talk about but never gets to...video games! Luke has become somewhat of an expert and we dive into where we think things are going and what we like about it in 2016. Eric Summerer, of the Dice Tower, returns to the third chair! Up first we do some mulling mechanics on board games which are made by their crazy components. Later we dive into a full, detailed review of Colt Express, a board game with crazy components and cowboys! Teras Cassidy of Geek Nation Tours is back in the third chair and gives us an update on Geek Touring and other projects he has under way. Later we take a close look at Konflikt 47 from Warlord Games, the new "Wierd War II" miniature game based on Bolt Action. We've got a CGO in the house! Curt Parr has the interesting title of "Chief Gamification Officer" and he shares with us how gaming concepts can be used in business training. Later we dive into one of the hot board games from Gen Con 2016: Dragon & Flagon from Stronghold games and the Engelstein design team. The 2016 Gen Con mob joins us in the 3rd chair! Up first Russ manages to sit down with Matt Wilson, the creative force behind Privateer Press, and ask him what's it like to have seen Privateer Press come so far? Later we convince the mob that it's time to play "Gamer Pyramid"
Sam Zitin joins us in the third chair! Sam has been running youth groups in his community very successfully for some time now. We catch up with Sam and ask him how he got into it and what he looks for in games to work in that environment. Later we dive into two games that really work well in that kind of venue. Codenames and Dead Last. How do they play and what do we like about them? Norbert Brunhuber, a man who has run more Warmachine and Hordes organized play than I care to think about, is back in the third chair! And of course the topic on all of our minds...the latest edition of Warmachine & Hordes from Privateer Press. aka "Mark 3"
Up first, we chat with Norbert about the "Metagame" in the WM/Hordes community as mark 2 drew to a close and what kinds of things people hope to see from the game and the models with Mark 3. Later we dive into the specific changes in Mark 3 in both game systems. What did change? What has not? And how does the game feel now? Ross Watson, RPG writer about town, is back in the third chair! We catch up with Ross on his latest project, Savage Rifts: Adapting the classic Rifts RPG into the Savage Worlds system. How did the Kickstarter end up? Where is the project now and what can we look forward to? Later we dive into a DM'ing tips and tricks session when Russ tries to create a new term: "The Tactical Narrative." What the heck is that and why should you try to make one as a game master? Mike Tunez of Firelock Games joins us in the third Chair! Up first Mike fills us in on Firelock's first game: Blood and Plunder! Pirate miniature combat. Later we dive into the miniature gaming hotness Craig fell in love with at Adepticon 2016: Arena Rex. Raef "Hollywood" Granger is back in the third chair! In classic Raef style we gather around his 'round table' and discuss random topics that only he could dream up. Later we revisit our passion for Dungeon Crawlers...why do we like them and how have they evolved since we last chatted about their mechanics? Jeff Siadek joins us in the third chair to talk gaming and the follow up to his smash hit Battlestations. And later Craig, Jeff, & Russ review the the golden age of Sci-Fi dungeon crawler "Space Cadets: Away Missions" from Stronghold Games! Seppy Yoon, of Fight in a Box, joins us in the third chair! Prior to becoming a game designer Seppy was a big marketing guy. So we dive into the topic of Gorilla marketing, how can you get your game brand out there? And later Craig and Russ interview Seppy on how he got his start in game design and his current project: End of the Line on Kickstarter. Tom Vasel, the dean of board game podcasting, is back in the third chair! Since we've got Tom on the show and WE KNOW Tom gets early access to all the coolest games, we decided to grill him on the upcoming hotness from Fantasy Flight Games: Star Wars Rebellion. Does it play as cool as it looks? And later Tom, Craig, and Russ dive into a detailed review of the viking filled game...Blood Rage from Cool Mini or Not. Dan Yarrington, the Tabletop Tycoon, is back in the third chair! Dan keeps helps us review some brand new hotness: Legends of the American Frontier. Can this story telling, card driven game capture the feeling of being born on a mountain top, taking out a bear at age 3, and patching up the crack in the Liberty Bell? Romeo Filip, of Battlefoam and Wild West Exodus, joins us in the third chair! 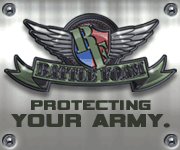 Up frist Romeo brings us up to speed with all the things happening at Battlefoam and Wild West Exodus since we last chated. Later, the three dive into Guild Ball... how do all the rules work and what makes this new sports miniatures game from Steamforged tick? Rick Priestley, miniature wargaming designer behind so many well known games, is back in the 3rd chair! We chat with Rick about his latest project: Beyond the Gates of Antares...the new miniature war game from Warlord Games. Later, Craig and Russ then dive into a detailed review of Beyond the Gates of Antares...how does this Sci-Fi 28mm unit based miniature war game play? As 2015 draws to a close it's time for our annual tradition: the D6G predictions epidsode! Join us as Raef, Craig, and Russ review their predictions from 2015 and look to the future...what will 2016 hold? Raef 'Hollywood' Granger is back in the third chair for a Sci-Fi packed episode! Raef has been playing a lot of Fantasy Flight Game's X-wing miniatures game lately. And recently he has discovered some fantastic fan made co-op campaign rules. How does it play? We dive in for the details. Later we dive into more space battle goodness with Halo Fleet Battles from Spartan Games. How is this new fleet engagement game and how does it stack up to Firestorm Armada and Star Wars Armada? RPG writer Dean Gilbert is in the third chair! Dean has a huge amount of RPG experience with games both great and small. He takes us on a tour of some of the best RPG's you may never have heard of. Then later we dive into a big review of a little game called "Tiny Epic Galaxies." Teras Cassidy, of Geek Nation Tours, is back in the third chair! Since we have the king geek of travel on the show, we felt it only right to talk about great travel games. What should you bring on a trip? And later we dive into a full review of fantasy skirmish miniatures combat game Frostgrave. Stephen Buonocore, of Stronghold Games, is back in the third chair! Up first Craig and Russ talk with Stephen about the game industry trends of 2015. Are things still on the rise? What's with all the mergers? Later we have another mulling mechanics segment. This time on games with a 'hidden traitor'. Ross Watson, the master of grim dark and RPG's is back in the 3rd chair! Up first Craig and Russ 'rap with Ross' to find out what he's been up to since last he was on the show. Lot's of exciting projects for RPG fans. Later we leverage Ross's massive Warhammer 40,000 experience and give a detailed review of Fantasy Flight Game's Forbidden Stars. The conquest game set in Games Workshop's WH40K universe! 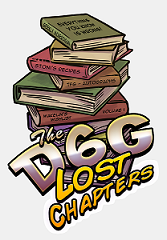 D6G Ep 172: GenCon 2015 Play by Mob & More! The GenCon mob is in the 3rd chair!! Craig, Russ, and Total Fan Girl are joined by a mob at GenCon 2015 for Achievements in gaming and our wacky play by mob event! And later Craig and Russ give the rundown on GenCon 2015. What was the hotness and how did it go? John "Indiana" Richard joins us in the third chair! John is a podcast veteran who has taken to video reviews! We chat with him about what the transition was like, and what challenges does video present that audio folks get to avoid. Later, we dive back into Imperial Assault from Fantasy Flight Games. This time we take a close look at the two player skirmish game. Is this just a tack on product? Or is there a real second game hiding inside the first? And don't miss a return of Words from Wales! Geoff Englestein: Game Designer, Podcaster, and Professor of Gaming is back in the third chair. First, Russ quizes Geoff and Craig on both what it's like to work with other people's IP and what it's like to have others work with yours. Oh, and Geoff gives us a little preview into "Survive: Space Attack" from Stronghold Games. And later the three of us give a detailed review of Fantasy Flight Games' co-op X-Com: The Board Game. Just how hard is it to save the world from aliens. More importantly...is it fun? Jon "Yakface"Regul of DakkaDakka.com returns to the third chair! Jon is no stranger to miniature war games having been a powerful force behind DakkaDakka.com and the 40k INAT FAQ for many years. So image how exicted we were to learn he and others from Dakka Dakk were launching a brand new miniatures game: "Maelstrom's Edge." Join us as we quiz Jon on all the details of this new hotness. And later Jon, Craig, and Russ dive in to more new hotness: Star Wars Armada and find out why it's both the rules AND the miniatures that make this game great. Raef "Hollywood" Granger returns to the third chair! Craig and Raef are freshly returned from Adepticon. 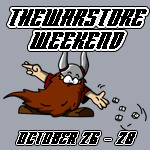 Up first: Raef played in Warmachine tournaments all weekend long. What was it like getting back into the tournament scene after such a long absence. Later Russ quizes Craig and Raef on all the new hotness they saw at Adepticon 2015. Owen Staton, famed Welsh story teller, returns to the third chair! We spend almost the entire episode chatting about Wizards of the Coast Dungeons and Dragons 5th edition? Why has Russ's family become obsessed with it? Up first, a detailed review of the Player's Handbook and character creation. Later Owen, Craig, and Russ discuss the methanics in detail and the quality of the Dungeon Master's Guide and Monster Manual. Neil Fawcett, the man behind Spartan Games, returns to the third chair! First Neil brings Derek Sinclair along and the four of us chat about "The State of Spartan Games." What does Derek do and what is Spartan up to? Later later we take a deep dive into the latest announcement from Spartan Games: a partnership with Microsoft to bring Halo to the miniature gaming tabletop! Teras Cassidy of Geek Nation Tours is back in the third chair! Teras was kind enough to wrangle Keith Meyers to join us on the show. Keith is the Marketing and Events Manager for iello USA. We chat with him about how he got into the industry and what new hot games iello is up to. Later we review Among the Stars from Stronghold Games. A beautiful card game with a strong space theme. Will even Craig like it? And it's finally time to announce the winners of the Stronghold Games contest. This time around the entries were AMAZING. Don't miss the fantastsic efforts our listeners!